“I remember it as an awful lot of fun and that I made an awful lot of mistakes, and I wish I could go back and be more uniting in my language. Because I think I played a role, unfortunately, in helping tear the country apart. And it’s not who we are. I didn’t realize how really fragile the people were. I thought we were kind of a little more in it together. 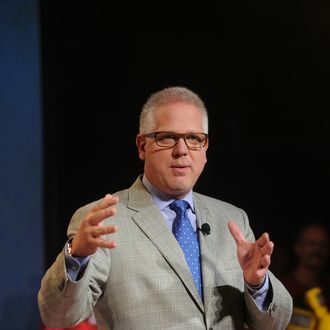 Now I look back and I realize if we could’ve talked about the uniting principles a little bit more, instead of just the problems I think I would look back on it a little more fondly.” —Former Fox News host Glenn Beck reminiscing with regrets about his time fearmongering and race-baiting on TV. “So somebody tweeted last night and said, ‘Glenn, what did you think of the Coke ad?’ And I said, ‘Why did you need that to divide us politically?’ Because that’s all this ad is. It’ in your face, and if you don’t like it, if you’re offended by it, you’re a racist. If you do like it, you’re for immigration. You’re for progress. That’s all this is: to divide people. Remember when Coke used to do the thing on the top and they would all hold hands? Now it’s, have a Coke and we’ll divide you.” —Beck again, weeks later, on last night’s Super Bowl ad for soda.